For beautiful Atlanta flowers for any occasion, from new baby arrivals to celebrating love, trust a Teleflora florist. When you send Teleflora, a local Atlanta flower shop will hand-deliver a lovely floral bouquet or gift basket, ready to be displayed and enjoyed. New, new and brand new! Did someone you know get a new job, have a new baby, or graduate from Emory University or Spelman College? Fresh and brightly colored flowers delivered from you will let your Georgia recipient know just how excited you are for their new accomplishment. 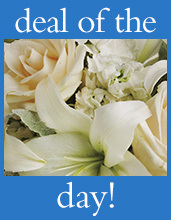 Congratulations bouquets are the perfect gift to send! With a huge array of floral bouquets from “Just Because” flowers to “Thank You” flowers you will be able to choose the best gift to suit any floral style. Our peach-colored roses are sure to make any Georgian smile. And the Big Hit bouquet is perfect for an Atlanta Braves fan! Teleflora’s florists in Atlanta are among the most talented and trusted professionals in the industry. Whether it’s a high-fashion corporate gift headed to a Midtown Atlanta high-rise or a charming housewarming gift for a friend’s new home in DeKalb county, we’ll create the perfect gift. With same-day Atlanta flower delivery available, it is easier than ever to have beautiful flowers sent to anyone that you wish!